Organizations like The Children’s Advocacy Center rely on support from the community to provide many of the services they offer. There are a number of ways you can help. 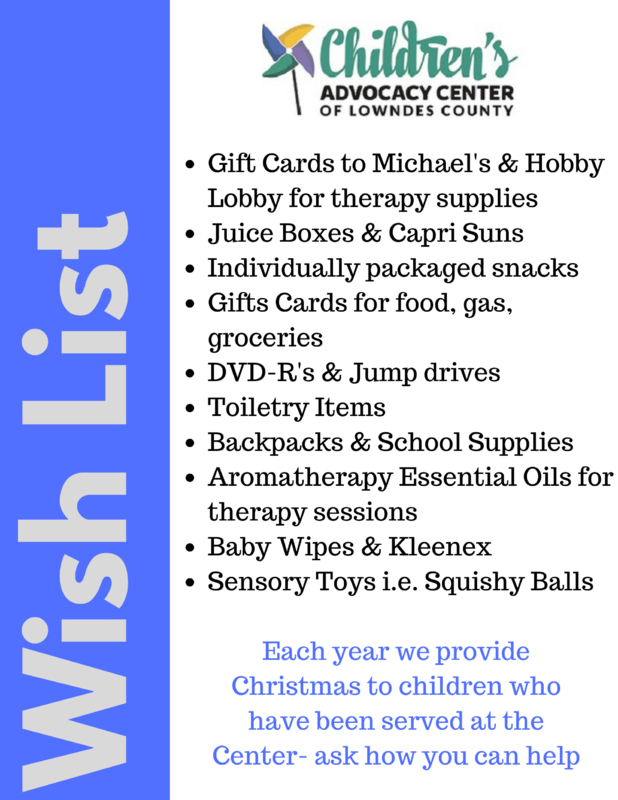 Financially support The Children’s Advocacy Center of Lowndes County, Inc. Your support will go towards assisting our on-going program needs. Juice box and snack drives and donations. CAC provides a juice and individual snacks to each child when they come to the center. Volunteer your time. Volunteers perform supporting roles in our administrative area, maintenance of our facility and grounds, and performing in our prevention program. Schedule an educational program with organizations you are involved with. These programs contribute to the public awareness campaign of The Children’s Advocacy Center. In addition, you can tell your elected officials that you support the concept of The Children’s Advocacy Center. The Center needs the cooperation of many state, county and city agencies in order to be truly effective. Let your elected representatives know that the CAC is very important to you and the community. For more information contact the CAC at 229-245-5369. Paper goods, i.e. paper towels, toilet paper, paper plates, 16 oz. cups, etc.